Ara A. Salibian, MD, Karl C. Bruckman, MD, DDS, Jonathan M. Bekisz, MD, Joshua Mirrer, MD, DDS, Vishal D. Thanik, MD, Jacques H. Hacquebord, MD. Purpose: Postoperative immobilization after operative fixation of unstable distal radius fractures and management of these fractures in elderly patients remains an area of debate. The purpose of this study is to delineate how practices by fellowship-trained hand surgeons in the United States compare to current evidence-based protocols. Methods: A 13-question survey was e-mailed to American Society for Surgery of the Hand members. The survey consisted of sections pertaining to 1) participant demographics 2) preferred methods of fixation for unstable distal radius fractures, and 3) postoperative immobilization protocols. Questions also addressed variance in protocols with volar fixed-angle plate fixation and differing practices in patients greater than 65 years old. Descriptive statistics were performed for all responses as well as for subgroups based on number of years in practice (>20 or <20 years of post-training experience), residency training background, and practice setting (academic, private, etc.). Differences in response patterns among these subgroups were analyzed using Pearson's chi-square test. Results: Four hundred and eighty-five surveys were analyzed (19.9% response rate). Respondents were most likely to work exclusively in private practice (35.9%) or in private practice with academic affiliation (29.0%). Volar fixed-angle plating was the most common choice of fixation of unstable distal radius fractures (85.1%) (Figure 1). Patients are most often immobilized for 1-2 weeks after fixation (40.0%) followed by 4-6 weeks (24.2%). Range of motion therapy was initiated most commonly between 1-4 weeks (47.2%) while only 8.1% began therapy immediately postoperatively. 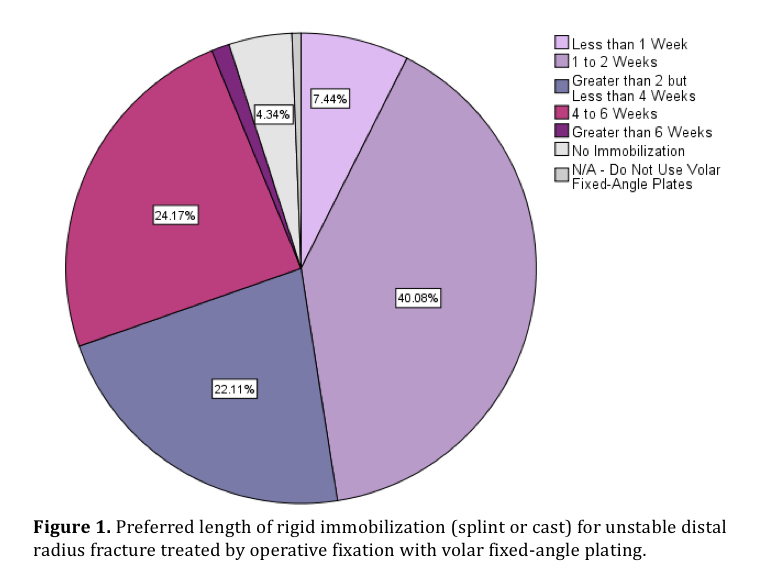 Almost 60% of respondents indicated they did not change length of immobilization if using methods of fixation other than volar fixed-angle constructs. The majority of surgeons do not treat fractures differently with regards to fixation (74.4%) or immobilization (72.8%) in patients greater than 65 years old. Physicians with greater than 20 years of post-fellowship experience were more likely to begin ROM sooner with volar plating versus other fixation techniques compared to physicians with less than 20 years of experience (p=0.031). Also, physicians in academic-only practices were more likely to immobilize patients for a shorter time after volar plating compared to those in privademics (p = 0.011). Conclusions: Though evidence supports improved functional outcomes with early mobilization after operative fixation of unstable distal radius fractures and conservative management of fractures in elderly patients, reported practice preferences of the majority of hand surgeons significantly differ from current evidence-based protocols. Understanding the reasons behind this discrepancy will help guide adoption of evidenced-based management.